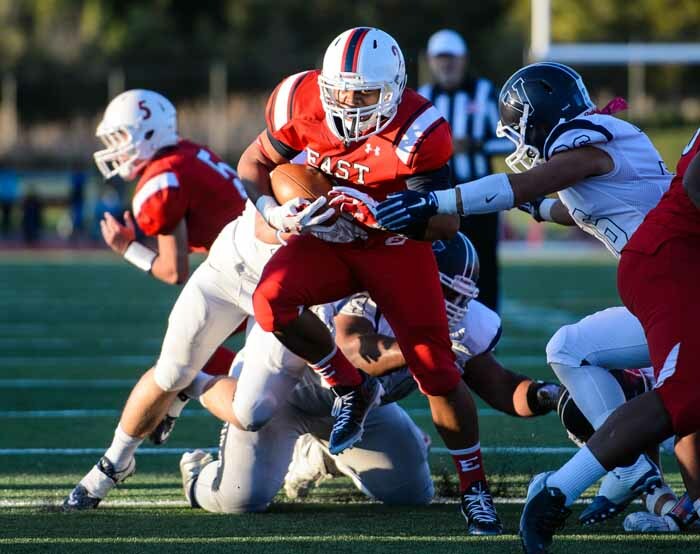 There is no doubt that the team performance of the year came Friday night in Concord, California, where East knocked off perhaps the most prolific football program in the nation, De La Salle. Big wins for Roy, Lehi and Skyridge, among others highlighted the action in-state as the season reached its halfway point. The list of elite individual performances from all across the state Thursday and Friday night is long, so as we do each week, here is our best effort at recognizing the players and the numbers that jump out at us, at least from the stats for which we have access through the multiple sources we check…. The game of the night took place in California, where Matt Barker made field goals from 28 and 35 yards earlier in the game before knocking a 39-yard attempt just over the crossbar with one second remaining as East (5-0) upset national powerhouse De La Salle (3-1) on the Spartans home field. Jaylen Warren showed that his ability to put up big numbers behind an outstanding offensive line carries over no matter who or where the Leopards play. The senior ran it 26 times for 256 yards and two scores. Sati Tu’uhetaufa had eight tackles for East and Moa Heimuli recorded nine as the defense held a powerful De La Salle offense in check. Huge night for Angelo Rios, who ran for 325 yards on 24 carries and scored three times to lead Ben Lomond (1-1 3AA North, 4-1) past Logan (1-1, 1-4) 42-34. Kenyon Harris was very efficient in the passing game, completing 20-of-26 for 323 yards and three TDs, and Deontay Nish caught 10 passes for 169 yards and all three of those scores while also picking off a pair of passes on defense. Jonny Parkinson tossed three touchdowns but was also picked off three times for Logan while passing for 303 yards, with Kaden Jones on the other end of seven of those aerials for 115 yards and a TD. 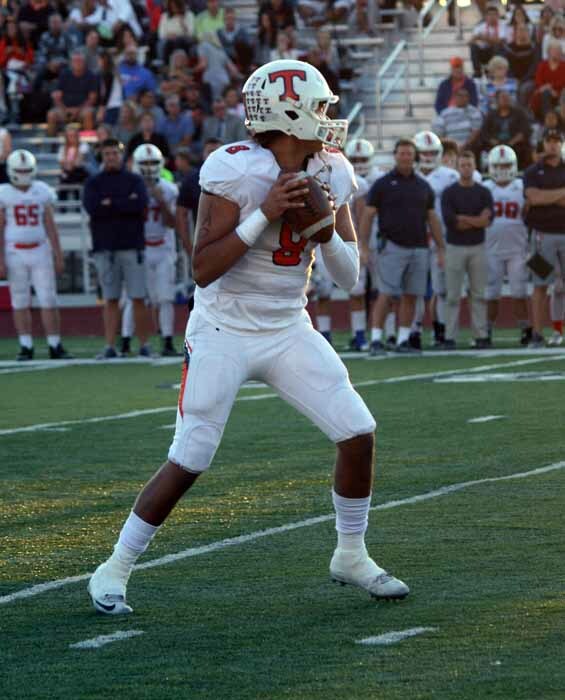 A week after dropping a heartbreaker on the road at Alta, Timpview (1-1 Region 7, 4-1) traveled across town and won a sloppy game against Provo (1-1, 3-2) 38-3. Both teams seemed intent on giving the game away much of the night, but it was the Thunderbirds who finally dialed it in and pulled away for the win behind Jordan Mariteragi, who completed 21-of-32 for 373 yards and three scores. Kyle Van Leeuwen caught nine passes for 218 yards and two TDs, while Jake Biggs caught four balls for 95 yards and ran it five times for 59 yards and a touchdown. Defensively, Jackson Cravens dominated with 10 tackles and four sacks and Chaz Ah You put the game on ice with a 27-yard pick-6. It was a rough night on the injury front for the Bulldogs, who were watching linebacker Tasi Lesa (10 tackles and an interception) make plays all over the field until he left the field midway through the third quarter with a leg injury. He spent the rest of the night at the trainer’s table with receiver Ty Jones, who missed nearly the entire second half after an injury. The Taylorsville (1-1 Region 3, 1-4) offense continued to fire on all cylinders, but this time it was finally rewarded with a win as the Warriors out-gunned Brighton (1-1, 1-4) 47-44. Pastor James Lewis ran for 265 yards on 24 rushes, with two TDs, while Dane Leituala passed for 232 yards with three scores and ran for 152 yards and two touchdowns on 24 carries. Jace Simons had seven catches for 171 yards and three TDs. As he does pretty much every week, Sione Lund played big again for the Bengals, running for 208 yards on 16 carries and catching a pair of passes for another 66 yards and a score. The game that started the weekend was a barnburner from Region 6 as Kearns (1-0 Region 6, 4-1 overall) knocked off Hillcrest (0-1, 0-5) 41-35. Sese Felila posted one of the week’s biggest numbers with 27 carries for 237 yards and three touchdowns. Kaden Leonard was good on four field goals and Journey Buba had 17 tackles for Kearns. It took just 21 carries for Riley Smith to pick up 244 yards and two touchdowns in leading Davis (1-1 Region 2, 4-1) to a 35-7 win over West (0-2, 0-5). Will Dana completed 21-of-28 passes for 370 yards and four scores in leading Alta (2-0 Region 7, 5-0) over Orem (1-1, 1-4) 47-28. Landon Maxfield had five receptions for 126 yards and two touchdowns and Josh Davis ran for 83 yards and caught passes for 30 more. The Tigers had the running game going, though it wasn’t quite enough, as D’Arman Notoa carried 33 times for 229 yards and a TD. The Seth Kaelin (24 carries, 258 yards, TD & 2 receptions, 87 yards, TD) and Tommy McGrath (17-for-29, 345 yards, 5 TDs) show lifted Skyline (1-0 Region 6, 3-2) over Murray (0-1, 2-3) 48-38. Briggs Binford caught four passes for 128 yards and two touchdowns to aid the effort. The Spartans had their air game clicking in the loss, as Noah Shoeman completed 26-of-44 for 312 yards and three scores, with six of those connections and two TDs coming to Gage Cuthbertson, who had 114 yards receiving, and seven completions going to Jordon Orozco for 103 yards. Christian Snowden picked up 206 yards and an 89-yard TD on 16 carries to lead American Fork (4-1) to a 21-13 non-league win over Maple Mountain (0-5). One of the night’s fantastic finishes delivered victory to Skyridge (2-0 Region 7, 4-1) over Corner Canyon (0-2, 2-3) by a 31-28 final. Cody Frampton hit Wyatt Parkinson with a 49-yard scoring heave with 1:02 remaining to put Skyridge over the top. Jaxon Peck had a pair of interceptions for the Falcons, while Frampton threw for two TDS and ran for two more and Parkinson hauled in six passes for 109 yards and that critical score. The Chargers were paced by Zach Wilson, who completed 23-of-35 passes for 326 yards and three touchdowns, with Colton Lawson as his primary target catching 11 balls for 218 yards and two TDs. It took overtime, but Springville (2-0 Region 8, 5-0) remained perfect on the season with a 33-27 win over Spanish Fork (0-2, 1-4). The victory was sealed after the Dons fumbled in overtime. Payton Kelepolo carried 31 times for 123 yards and two touchdowns and Jantsen Thorpe connected on TD tosses of 40 and 75 yards, with the latter going to Bennet Hullinger, who also ran one in from 30 yards out. A 35-point second quarter carried South Summit (1-0 2A North, 5-0) to a blowout win over American Leadership Academy (0-1, 3-2). Nick Beasley did his best work through the air in this one, passing for 277 yards and five touchdowns on 14-of-22 passing, with Brandon Dansie catching six passes for 117 yards and four scores and Parker Grajek grabbing five for 101 yards. Stansbury (2-0 3AA North, 4-1) stayed hot in shutting out Judge Memorial (0-2, 0-5) 41-0 as Matt McIntyre ran it 18 times for 165 yards and a touchdown, and McCoy Didericksen picked up 93 yards on nine carries with a pair of TDs. A 5-yard TD pass from Austin Meone to Demetrius Smith followed by a two-point conversion run by Meone delivered the 22-21 win to Tooele (1-1 3AA North, 4-1) over Ridgeline (1-1, 3-2). Jeno Bins picked up 107 yards on 12 carries and Lincoln Powers ran it 32 times for 106 and a score. Lone Peak (2-0 Region 4, 4-1) found every conceivable way to score in its 48-0 win over Riverton (0-2, 0-5). Quarterback Dakota Hansen combined with Tyler McPherson on scoring tosses of 52 and 58 yards and Jackson McChesney ran for 117 yards and a touchdown on just eight carries. There was also a pair of defensive TDs as Seth Larsen took a fumble back 50 yards for one score and Jimmy McKeon had a 20-yard pick-6. In front of a huge crowd at its home field, Roy (2-0 Region 1, 4-1) handed Fremont (1-1, 4-1) its first loss of the year 27-20 behind 15 carries for 103 yards from Hunter Mather. Sky View (2-0 Region 1, 4-1) took care of Clearfield (0-2, 0-5) 27-14 as Jackson Siddoway passed for 205 yards and a pair of scores, with Brock Mortensen hauling in six passes for 122 yards and a touchdown. Hunter (1-1 Region 2, 2-3) picked up a 33-13 victory over Granger (0-1, 3-2) behind the running of Ty Carlson, who carried 27 times for 167 yards while also taking his one pass reception for another 64, and Pailate Makakona, who ran for 101 yards and three scores on his 20 carries. Makakona also intercepted a pass and Tevita Tauvao recorded 2.5 sacks to power a strong defensive effort. NJ Mo’o pulled in a pair of TD receptions and also intercepted two Viewmont (1-1 Region 2, 3-2) passes as Syracuse (2-0, 4-1) held off the Vikings 13-6. After really struggling before intermission, quarterback Quinn Kiser broke out in the second half as a 21-yard fourth-quarter scoring toss to Braxton Porter proved to be the deciding play as Desert Hills (1-0 3AA South, 4-1) survived to knock off Cedar (0-1, 3-2) when the Redmen missed a field goal to close out the game. Kiser finished with 131 yards and two TD passes, with five of his connections coming to Logan Hokanson, who picked up 82 yards and scored once. Nephi Sewell gave the Thunder life as his pick-6 was the team’s only scoring before the break. Mason Fakahua (13-of-22, 258 yards, 2 TDs) and Derek Ball (six catches, 131 yards) were very good for the Redmen. Dixie (1-0 3AA South, 2-3) showed that it will be factor in region play with its impressive 38-7 win over Pine View (0-1, 4-1). Ammon Ah Quin ran it 21 times for 153 yards, while Malakai Fakahua had eight tackles and a pair of interceptions to lead the Flyer defensive effort. 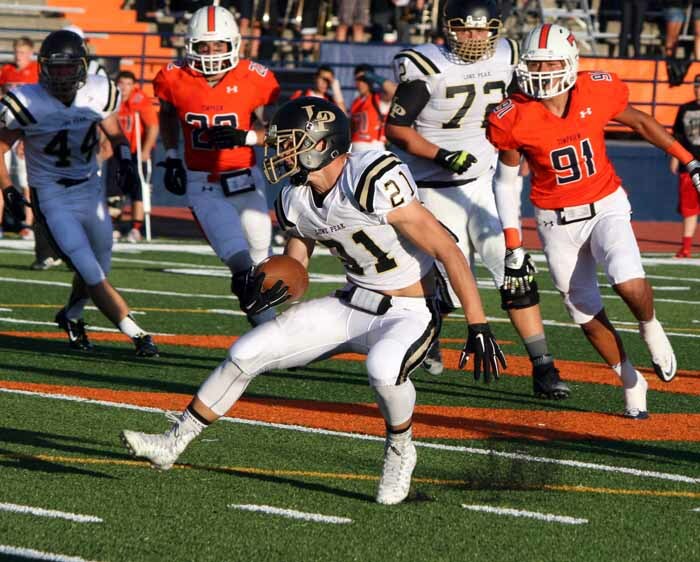 Elsewhere in 3AA South play, Jaron Cordova was the catalyst, with 165 yards and two TDs on 32 carries, as Hurricane (1-0 3AA South, 3-2) took care of Snow Canyon (0-1, 2-3) 22-16. After losing 15 straight matchups with Pleasant Grove (0-2 Region 4, 1-4), Lehi (2-0, 4-1) held on to beat the Vikings 28-23 for the first time since 1972 behind the stellar play of quarterback Cammon Cooper, who was 19-of-27 for 279 yards and two TDs while also running for a touchdown. Carson Terrell caught eight passes for 122 yards, Dallin Holker pulled in six for 83 yards and Kade Moore was on the receiving end of both TDs for the Pioneers. Jake Jensen was 15-for-24 for 298 yards and three scores for Pleasant Grove, with Dayne Christensen catching five passes for 199 yards and two TDs. Sefanaia Leakehe carried 28 times for 147 yards and a score in leading Herriman (1-0 Region 4, 3-1 overall) over Westlake (0-2, 2-3) 23-17. West Jordan (1-1 Region 3, 4-1) got back on the winning track by a 45-14 count over Cottonwood (0-2, 0-5) as Dylan Krans tossed five touchdown passes on 17-of-26 passing for 237 yards. He connected five times with Tanner Peterson for 104 yards and three scores, and five times with Mack Wakley for 78 yards and the other two TDs. James Pembroke passed for 130 yards and ran eight times for 99 more yards and a touchdown as Highland (2-0 Region 5, 4-1) handled Box Elder (0-1, 2-3) 41-24. Jake Boren was a big-play guy on the outside as he turned two grabs into 93 yards. Olympus (1-0 Region 6, 4-1) cruised past Cyprus (0-1, 1-4) 49-0 behind Sawyer Pierce, who carried 10 times for 125 yards and two scores, and completed 8-of-13 passes for 175 yards and two more TDs. Timpanogos (1-1 Region 7, 3-2) rode the arm of Casey Hamilton (20-for-34 for 266 yards and four touchdowns) to a 45-14 win over Mountain View (0-2, 0-5). Carl Pinegar was the prime recipient of Hamilton’s aerials, catching six passes for 137 yards and two scores. As has become common for Salem Hills (2-0 Region 8, 4-1) this season, Villi Wolfgramm was outstanding on both sides of the ball in a 42-17 win over Uintah (1-1, 3-2). Wolfgramm ran it 15 times for 127 yards and recorded six tackles and an interception return for a touchdown to lead the way for the Skyhawks, who also benefited from Garrett Lloyd‘s effort. 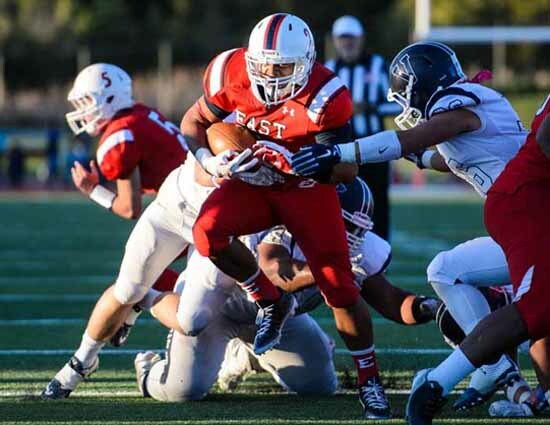 He went for 118 yards and a TD on just four carries, which included a 75-yard scoring scamper. Jordan Blake scored the game-winning touchdown in overtime after tying the game with a 45-yard pick-6 to pace San Juan (1-0 2A South, 4-1) to a 13-10 win over Beaver (0-1, 4-1). Blake finished the contest with 15 carries for 75 yards and that TD. With a 33-6 win over Grand (0-1 2A South, 3-2), South Sevier (1-0, 2-3) got its league season off to the right start thanks to a 95-yard interception return for a score by Porter Dowdell and 16 carries for 101 yards and two touchdowns from Tyson Chisholm. Dillion Smith had a solid night for Beaver with 25 rushes for 136 yards. Braxton Llewelyn passed for 225 yards and five touchdowns and Pedro Silva caught four passes for 98 yards and a TD to lead Layton Christian (1-0 1A North, 4-1) past Wayne (0-1, 0-4) 42-12. Milford (1-0 1A South, 4-1) grabbed the early lead in the region with its 28-12 victory over Parowan (0-1, 2-2) as Ty Netto ran it 21 times for 143 yards and a score. Preston Robinson had three receptions for 82 yards and a touchdown. Morgan (1-0 3A North, 3-2) powered past Juan Diego (0-1, 1-3) 49-20 as Conley Breshears toted it 17 times for 93 yards and a TD, and Austin Francis gained 81 yards on 18 carries with three scores. Trevor Skinner threw it just eight times, but completed five passes for 207 yards and a touchdown pass to Trevor Rose, who caught three for 120 yards. It was the first win of the year for Canyon View (1-0 3A South, 1-4) as it took care of Manti (0-1, 1-4) 38-10. Stockton Rigby picked off a pass on defense and carried it 14 times for 98 yards and two touchdowns, while Isaiah Shearer ran it 22 times for 89 yards and a score. Porter Miller recorded 15 tackles. Reygan Riding (15 carries, 159 yards) and Dallin Draper (22 carries, 149 yards, 2 TDs) carried the load for Delta (1-0 3A South, 3-2) in its 32-12 victory over North Sanpete (0-1, 2-2). 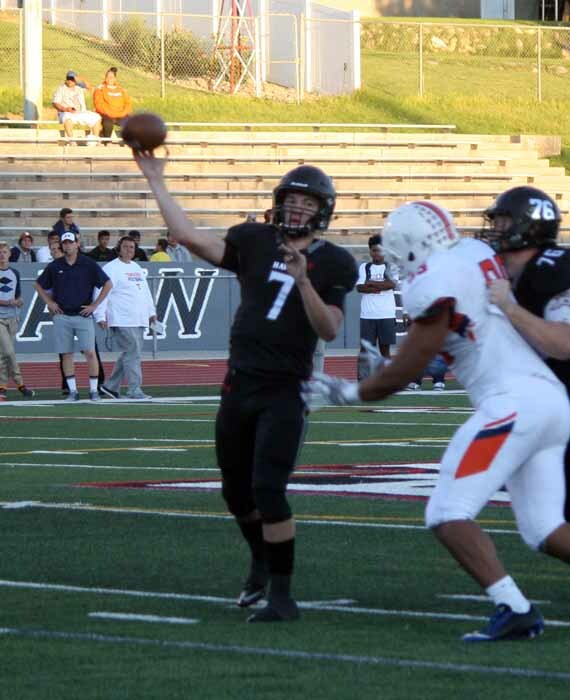 Nash Jones returned a kick-off 90 yards to the house as Wasatch (1-0 Region 8, 4-1) manhandled Payson (0-2, 0-5) 31-0. In a wild non-region battle, Bonneville (1-4) outscored Ogden (0-5) 49-42 as Andrew Kemp hooked up with Sage Thornock on a 50-yard scoring pass with 48 seconds left. Overall, Kemp ran for 63 yards and two TDs and passed for 214 and four scores. Thornock had six receptions for 103 yards and all four touchdowns, while Bronson Fox carried 24 times for 157 yards and a TD of his own. Carson White did throw four touchdown passes for Ogden. Duchesne (4-1) shut out Monticello (1-3) in a non-region game as Jarett Spencer completed 14-of-19 passes for 242 yards and a touchdown. Chad Lewis was on the other end of 10 of those passes, going for 179 yards and a TD, and Steven Skewes provided the balance with 115 yards and a pair of scores on 18 rushes.